Following on the previous two posts, here is the Partner or Folding Pages podcast. With the partner pages, students rediscover, reinforce, and extend the work they did on the graphic pages. They connect manipulation with computation and continue building memory by taking more spins around the city. Again, because of the lesson design, we can observe and assess how students are doing each step of the way – and make the adjustments our observations indicate. As we noted in the two earlier posts on this subject, ongoing or formative assessment is as valuable or more valuable than testing to the teacher or parent of students struggling in their study of mathematics. Here is an outline of an approach to integrating assessment into a math lesson. It involves designing materials that allow for observation, while accomplishing learning objectives, and then setting up many opportunities for the teacher and students to observe (assess) throughout the lesson. In subsequent postings, we will address several aspects of this lesson in more detail. 1. Start the lesson with a graphic representation of the concept and procedure handed out to each student. Asking questions, the teacher guides the students in a discovery of the core concepts. 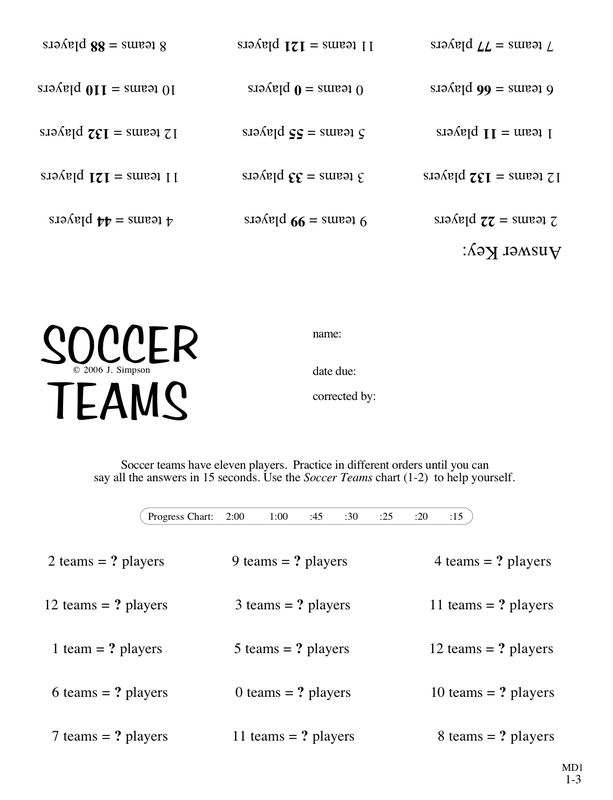 (Click on Soccer Teams or take a look at the next post for a model of this in teaching multiplication by 11s.) (See our later post Beginning a Lesson Using Guided Discovery for how to deliver a guided discovery lesson.) Since students have their own graphic page, the teacher is able to see who is moving their paper to construct problems. Conversely, it is pretty easy to observe who is looking around to see what to do, who is not moving their paper, or who has moved it too far for the given directive. This is easier to observe than if students are asked to jointly say the answer – it’s difficult to tell who knows the answer and who is copying. 2. Once the students are oriented to the graphic, help them make the connection between manipulation and computation with problem pages linked to the graphic page. The problem pages have the problems at one end and the answers at the other. The pages are folded in half so students see only the problems at first. (To see an example, click on Partner or Folding Pages or take a look at a subsequent post for our podcast covering partner pages.) The students do the first few problems together as a class so the teacher can assess if the class has the approach down. Then they finish the page on their own saying the answers quietly. 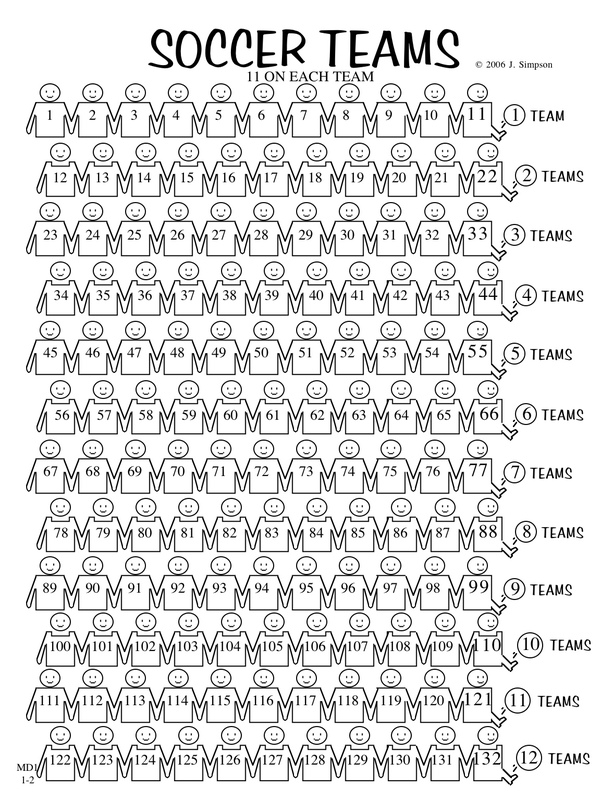 If a student makes a mistake, they have the graphic to reconstruct the problem. The teacher walks around checking in on them. Noticing a mistake, the teacher simply asks the student to show how they got that on the graphic to see if they understand what the problem means and if they can construct the right answer. Here the teacher continues assessing and the students begin to self-assess. Wrong answers do not linger for very long. And students are able to immediately retrace their steps on the graphic and see what a correct approach to that problem looks like. 3. Then one student models the top line of problems, constructing them on the graphic and saying the answers out loud, as the rest of the class follows along to make sure the answers are right. Another student completes the next line and so on. Here teacher and students are assessing. 4. Two students then model partnering with each other while the rest of the class makes sure both are doing it right. One student works the problems while the other looks at the answers and says “good” for correct answers or “try again” for incorrect answers. The student working the problems has the graphic to refresh the experience of the problems. They self-correct in real-time so no one leaves a page wondering if they got the answers right or not. And all of the problems are done so no needed practice is missed. Here students are assessing and self-assessing with observation and support from the teacher. 5. Then everyone works in partners with the teacher walking around, listening in and asking guiding questions where needed. Again, here students are assessing and self-assessing with observation and support from the teacher. This approach involves more teacher assessment in the beginning moving to more student assessment and self-assessment through the lesson. It includes ongoing observation, immediate response when the students are still engaged in the learning, and varied, repeated practice that is not rote (students can work the problems on the page in a different order each time). Like music students, math students can derive benefit from going over the same exercises more than once, as long as it does not become rote. At any point the teacher can adjust the lesson for the class or a student or group of students to address a prior skill needed for success with the given lesson as described above. As we noted in our previous problem of the week, “students’ development of mathematical reasoning involves making generalizations, and deeply felt generalizations are the result of making many specific observations…” So we offer a third approach to Pythagoras. Certain problems are also more compelling to some students than others. This problem presents an additional feature that an irrational number can be a reasonable and even unavoidable answer to the length of a side or hypotenuse. 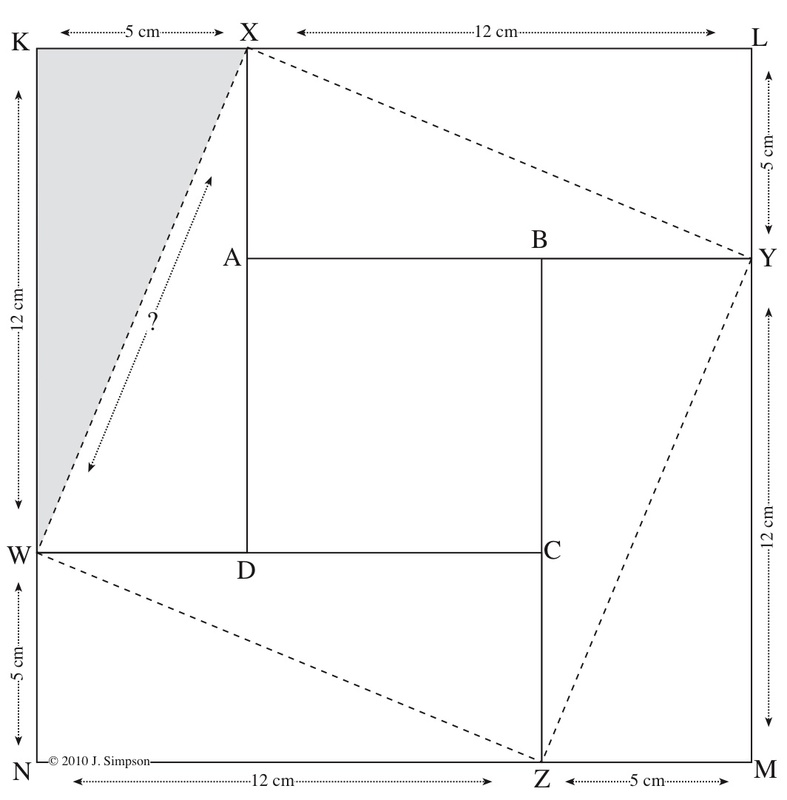 Like the previous pythagorean problems, this one allows students to come at the solution by reasoning their way through a consideration of area. It involves students thoroughly noticing the given (the implications of the given information). 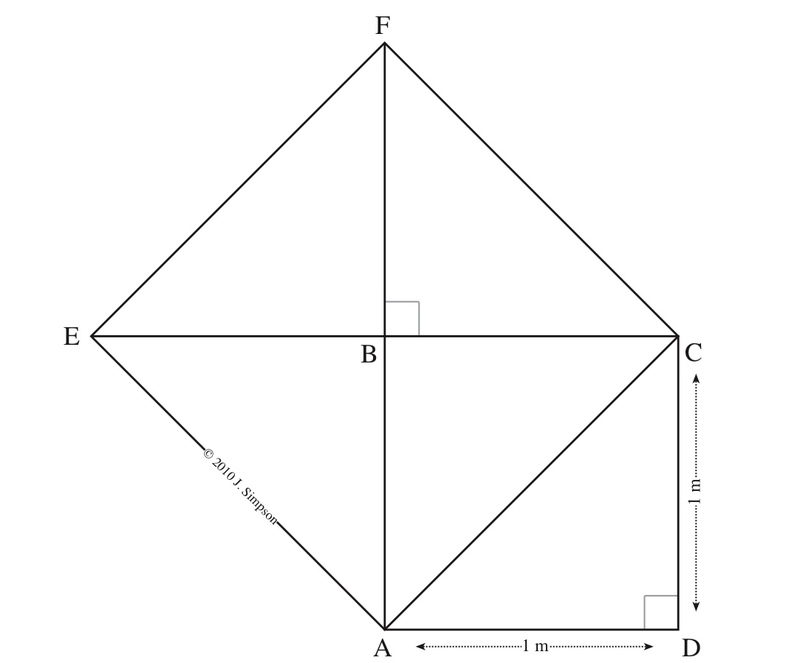 For instance, what kind of triangle is triangle ADC? Do they stop with one observation or do they notice and consider the implications all of the given information about that triangle? And it enables them to carry forward and reapply previous knowledge like the properties of various triangles, a square, and the angle-side theorems. 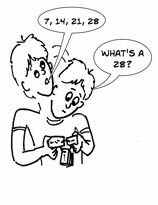 So again, imagine that you had never heard of the Pythagorean Theorem (a2 + b2 = c2), and that you did not have a ruler. Using only the drawing below, determine the length of line segment AC. All corners that look square are square. All lines that look parallel are parallel. The answer will be posted next week.